Last year (2015), the price of aluminum dropped from what it was the previous year (2014). Iceland has three aluminum smelters and Landsvirkjun (the National Power Company) generates great amounts of electricity to these smelters. One of the three smelters, Rio Tinto Alcan (RTA) in Straumsvik or ÍSAL, pays fixed power price (the tariff is linked to US Consumer Price Index; CPI). This contract between RTA and Landsvirkjun was made in 2010, with additions in 2014. The other two smelters have power contracts based on a different model, where the tariffs are linked to the price of aluminum (as the aluminum price is at the London Metal Exchange). These two contracts are from 1999 and 2003 respectively. The contract from 1999 is with the Norðurál smelter of Century Aluminum at Grundartangi, and the contract from 2003 is with the Fjarðaál smelter of Alcoa on Reyðarfjörður. Because of the two contracts having the tariffs linked to aluminum price, revenues of Landsvirkjun pr. each sold MWh to the smelters in 2015 were lower than in 2014. The graph at left shows how the power price paid by each of the three smelters developed in the period of 2005-2015. Each bar shows the average price of electricity each year, with regard to each smelter. Note that transmission cost is included in the tariffs (the average transmission cost is close to 6 USD/MWh). Landsvirkjun then forwards the transmission payment to the Icelandic TSO; Landsnet. 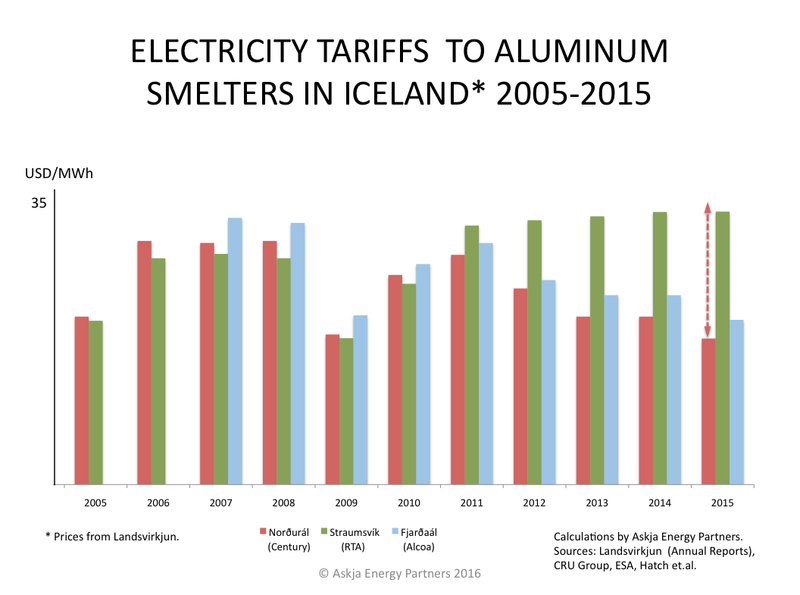 As can clearly be seen from the graph, the smelter of Norðurál (Century Aluminum) pays the lowest tariff. The smelter of Fjarpaál (Alcoa) pays a slightly higher tariff than Norðurál. 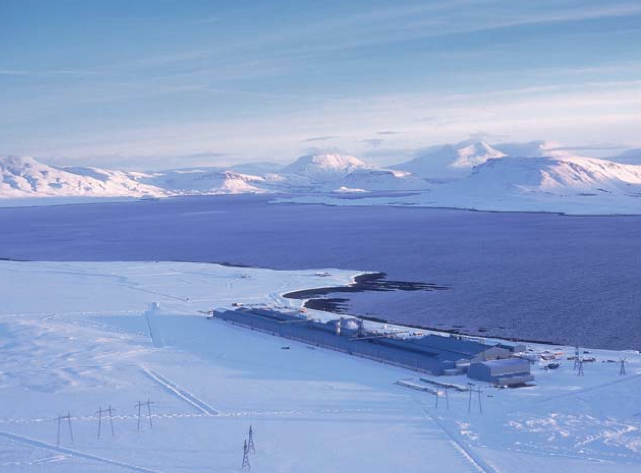 The smelter at Straumsvík (Rio Tinto Alcan) has the most recent contract and is currently paying the highest tariff of all the three smelters. Obviously, Landsvirkjun is taking substantial risk when it agrees on having the tariffs linked to aluminum price. At the same time the low tariffs, linked with aluminum price, make the Icelandic smelters of Alcoa and Century Aluminum almost financially risk-free operations. Century has come close to acknowledging this, by stating that its Grundartangi smelter in Iceland “generates significant free cash flow in virtually all price environments”. Currently, a new power contract of Landsvirkjun and Century Aluminum is being negotiated (the old contract from 1999 runs out in 2019). It seems likely that Landsvirkjun will offer Century a similar deal as Rio Tinto Alcan got in 2010. 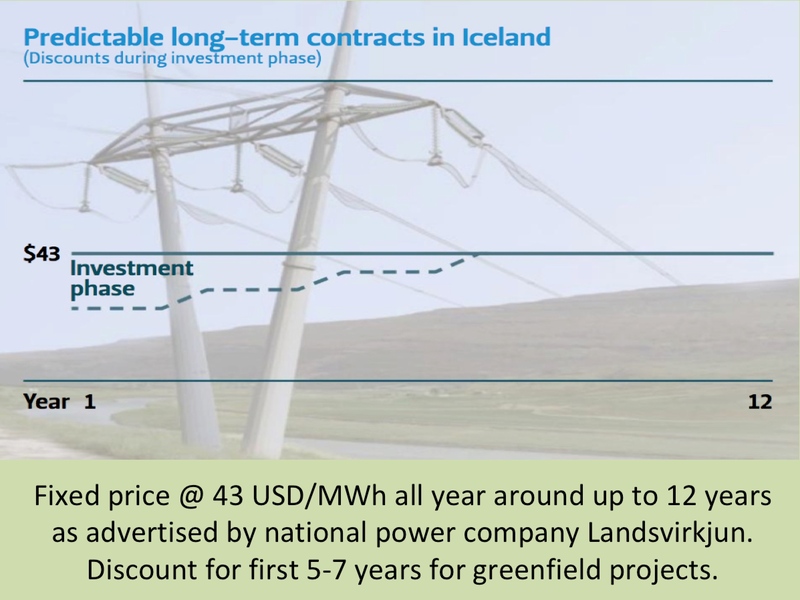 Which means that from 2019, we may expect that Century’s Icelandic smelter at Grundartangi in Southwestern Iceland, will be paying close to 34 USD/MWh (in todays value), as marked with a red arrow on the graph above. However, it might be a better deal for Landsvirkjun and its owner (which is the Icelandic State) to sell the power to Europe via HVDC cable. With regard to this, it should be noted that the governments of Britain and Iceland are now in discussions on the possibility of such a cable. NB: Power tariffs to the three smelters are estimated by Askja Energy Partners, with regard to annual reports of Landsvirkjun and several other information as published by CRU Group, EFTA Surveillance Authority, et al.